Smithsonian’s Great Battles of the CIvil War is a visually stunning, provocative history unlike any other Civil War program you’ve ever seen. This critically acclaimed television and video series from the National Museum of American History is a sweeping and compelling look at the war’s military, political and social history. Each episode features dramatic reenactments of important campaigns; first-hand accounts of eyewitnesses and participants read by distinguished actors; period photographs, paintings and artifacts; intriguing expert challenges to traditional historical thinking; original contemporary illustrations; computer enhanced maps; and music of the time. The strategies and motivations that created this devastating and heroic period come alive in this comprehensive reference. 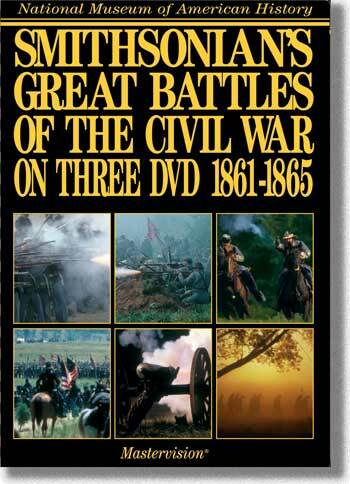 The DVDs and a laptop together can be a mobile history tour during your battlefield travels. Historical Advisory Board Appearing On-camera: Dr. James M. McPherson, Princeton University and author of the best-selling, Pulitzer Prize-winning “Battle Cry of Freedom;” Edwin C. Bearss, National Park Service; Dr. Edward C. Ezell, Smithsonian Institution; Craig L. Symonds, U.S. Naval Academy; Col. Robert A. Doughty, USA, U.S. Military Academy; Col. Larry H. Addington, The Citadel; and Lt. Col. Keith E. Gibson, Virginia Military Institute. Readings by: Charlton Heston (Abraham Lincoln), Richard Dreyfuss (Gen. Grant), Burt Reynolds (Jefferson Davis), Dennis Weaver (Gen. Lee), Ossie Davis (Frederick Douglass), Peter Graves (Gens. Sherman and McClellan), Brian Keith (Gens. J.E. Johnston and Sheridan), Hoyt Axton (Gen. John B. Gordon), Burgess Meredith (John Brown and Adm. Farragut), and Trish Van Devere (Clara Barton).